If you're a frequent viewer of America's Next Top Model you'll see that Tyra Banks is fond of flaws and loves them. With a star-studded yellow carpet, an A-List guestlist and a night out in New York City, Tyra Banks held a ball Flawsome (flaws + awesome = flawsome) - ooh, I'm all for it! The ball was to benefit her foundation The Tyra Banks TZONE, which is housed at the new Lower Eastside Girls Club Center--you know, the one with the bakery and planetarium. With guests such as Olympic Gold medalist - Allyson Felix, her ANTM judges - Rob Evans and Kelly Cutrone and some others. With an exclusive performance from rapper Drake. See the rest of the beautiful pics at Tyra Banks' Flawsome Ball below! And POSE! Model, Tyra Banks looking extremely beautiful and is werking the life outta this dress. (L-R): Tyra Banks pictured with supermodel Chanel Iman. New judges on ANTM - PR Guru - Kelly Cutrone and model/Tyra's "apparent boo" Rob Evans. (L-R) Black Beauties: Both Tyra's mother - Carolyn and model/TV personality Padma Lakshmi both wore all black and little accessories - they know how to accessorize very well. 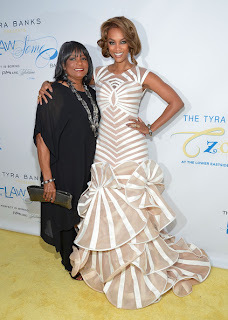 Tyra and her mom - Carolyn hit up the yellow carpet, her mother does not age. Flawsome. Boo'd up! (L-R): Tyra and her "boo" fellow ANTM judge Rob Evans are coupled up, they look so cute - if they are a real couple - then get it gurl! Actress Rosario Dawson is also in all black, both women look beautiful alongside each other. You're having a laugh!! : (L-R): Simon Doonan & hubby - designer Johnathan Adler laugh it up with Tyra on the yellow carpet. 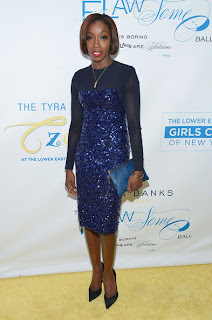 Basketball player Amar'e Stoudemire's fiance Alexis Welch also attended the event flaunt that diamond ring girl! Glowing GOLD! (L-R): Gold medalist Allyson Felix is the best dressed for me. After winning a couple Gold medals at the London 2012 Olympics, this girl has been glowing ever since. Love her dedication towards Charity. Badass swimsuit model Damaris Lewis also hit up the event, and is looking great. I wish she showed more of her body though because this woman's body - speechless!! (L-R): Long time Estelle! UK singer Estelle, I do not like this look on you. I think it's the hair, something's not right. Socialite/Jewelry designer and the "black Paris Hilton" Genevieve Jones supported her fellow friend Tyra with a little short dress on. Just cute. Vogue cover girl Sessilee Lopez looking like money!! CNN is in tha building!! News anchor Soledad O'Brien went for a more classy look. 46 and killing it. These 40+'s are giving these 20+'s a run for their money!